In an attempt to boost revenues, post offices in Europe and Australia have experimented with “print on demand” stamps. 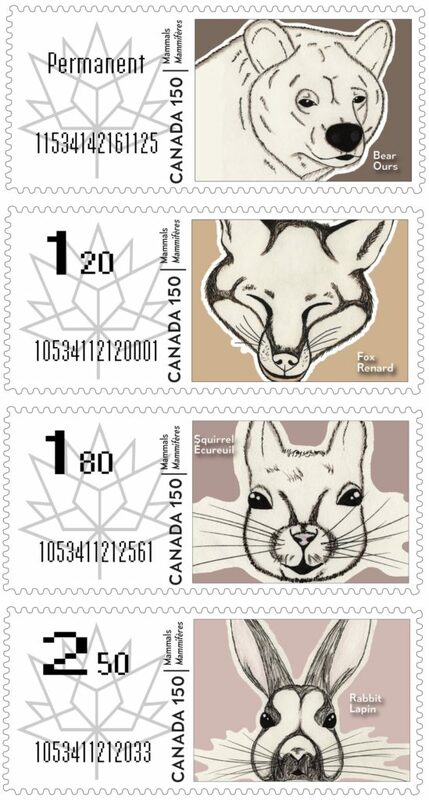 On October 31, 2016, Canada followed suit, with indoor and outdoor kiosks dispensing horizontal postage labels at a Canada Post specialty centre in Vancouver. Outlets in Calgary and Toronto followed. 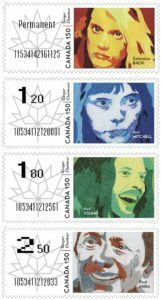 These first colourful self-stick stamps, with simulated perforations on all sides, feature landscape paintings by Canadian artists. Many of these initial printings are highly sought by collectors. 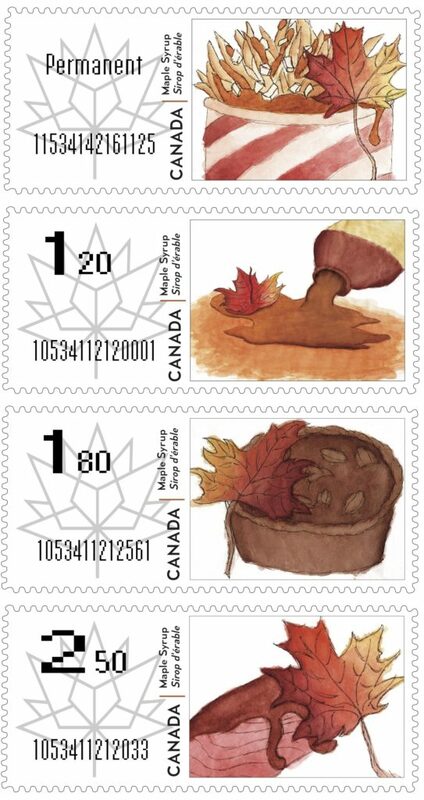 While Canada Post is now evaluating the output from these machines to determine their cost-effectiveness, the design aspect of “print on demand” stamps has some creative potential. 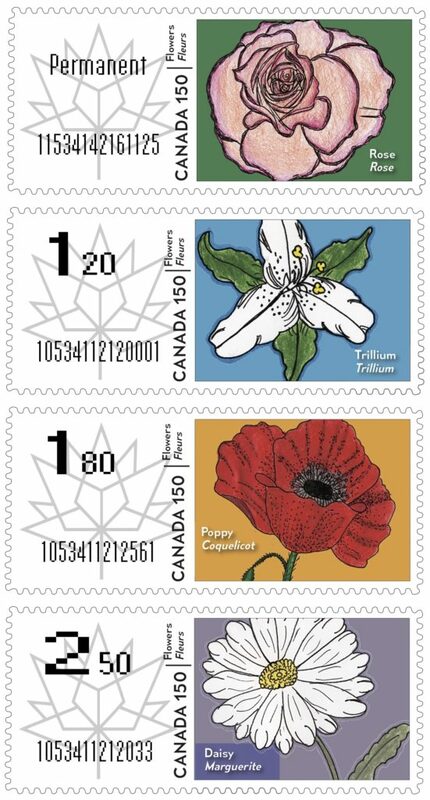 Since there is no investment in volume printing, and kiosks would stand to be regional, this opens the possibility of printing stamps on demand with illustrations and artwork that would have appeal to a particular province or region. 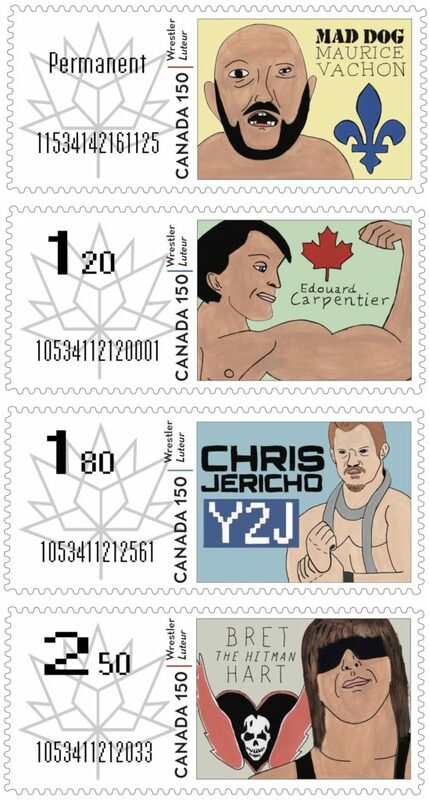 It would make perfect sense that stamps commemorating local celebrities, landmarks, industries and events would have considerable market potential within a given geographic area. 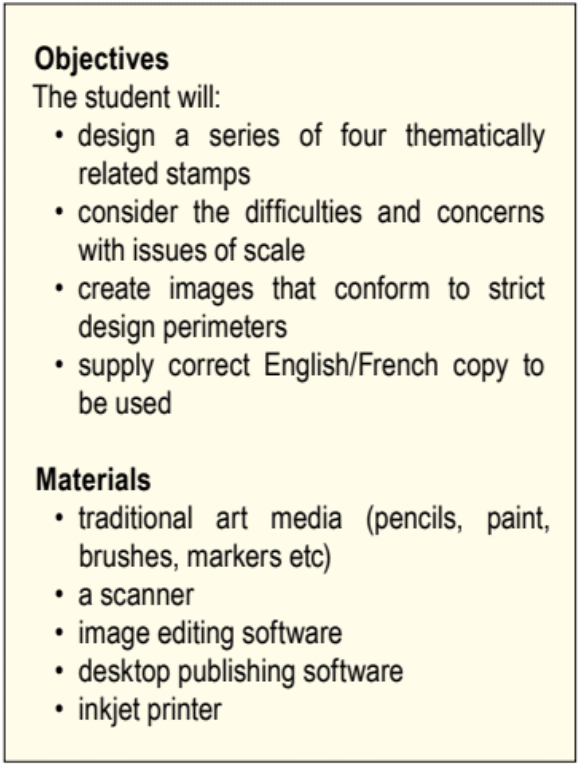 The Merivale High School’s senior design class decided to pursue this line of creative thinking and have designed a series of kiosk stamps that could have some regional appeal. The class looked at Canada Post’s current model and created mockups to fit their exact framework, complete with printed simulated perforations. 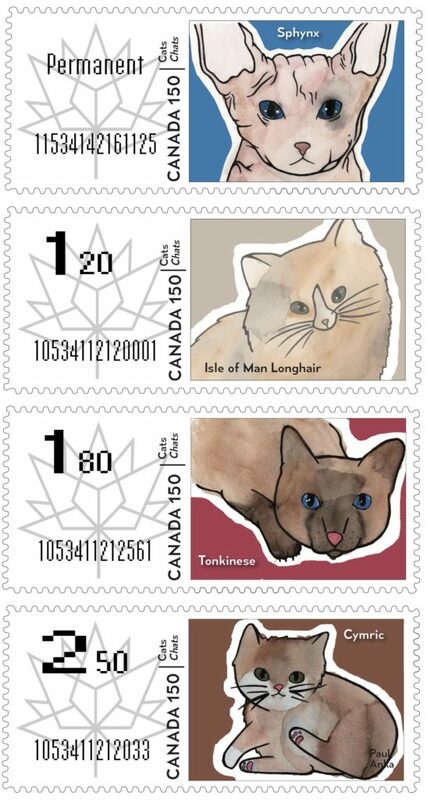 One of the design issues we discussed in class is the fidelity of small images on stamps. 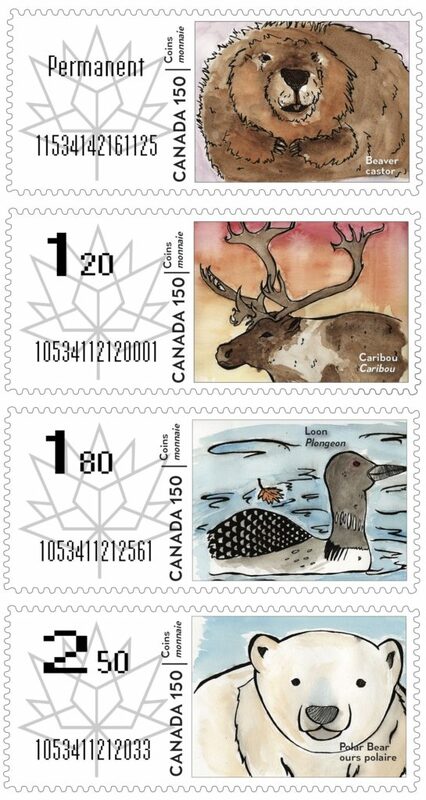 The current Canada Post kiosk stamps bear images from the collection of the Montreal Museum of Fine Art. While the work is certainly admirable, no one would disagree that large canvas oil paintings lose a bit of their lustre when reduced to postage stamp size. The students kept this variable in mind when creating their stamps and made a conscious attempt to tightly crop images and to render them in a way that would not suffer terribly when reduced. All artwork was scanned and retouched in Photoshop. A master template for all the designs, that included the simulated perforation frame as well as the denomination information and serial number was created in an Adobe Illustrator vector file and ported into a Quark XPress document so that the images could be easily inserted, cropped and resized if necessary. The additional French and English text was added in this stage using the special Canada 150 font used to celebrate Canada’s sesquicentennial. The completed files were saved in PDF format and printed on an Epson 3880 Ink Jet printer. 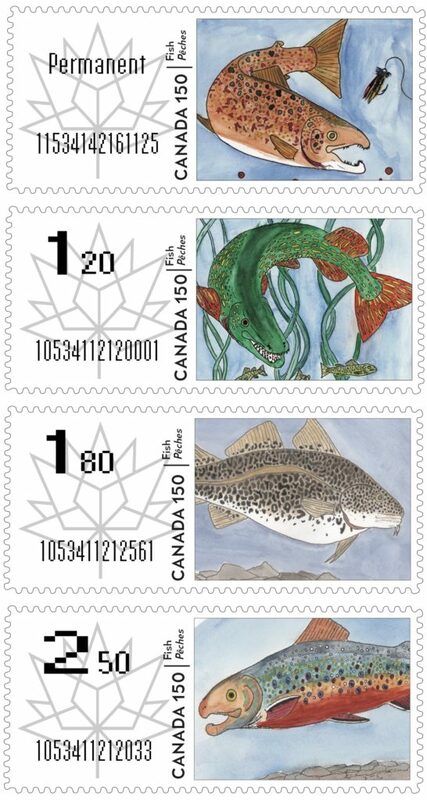 While some students took a fresh approach to athletes, animals, flowers, and fish, some new topics emerged that had not ever been previously considered for Canadian stamps. 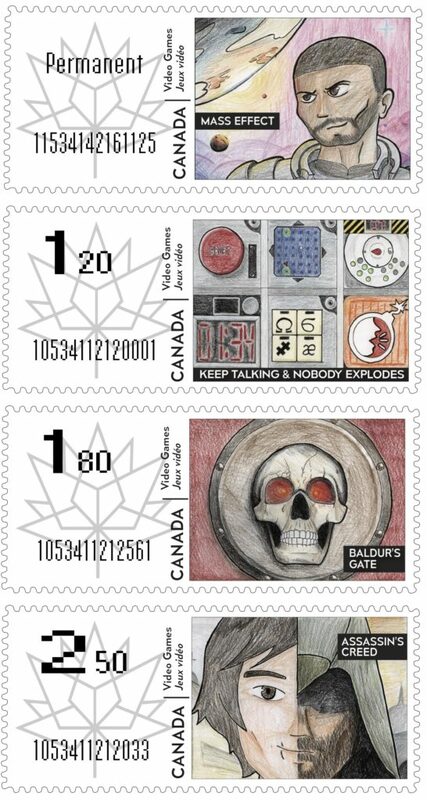 The younger set would appreciate Dexter Hunter-Laroche’s series of Canadian video game illustrations, and the popularity of post-secondary animation programs, as well as the growing animation industry, would no doubt celebrate Isabelle McLean’s series of animator stamps. No one would deny the serious contributions that Italian Canadians have made to the arts and culture sector, and Taylor Fortin’s excellent series of wrestlers would certainly be celebrated in Quebec where Mad Dog Vachon and Edouard Carpentier are legends. 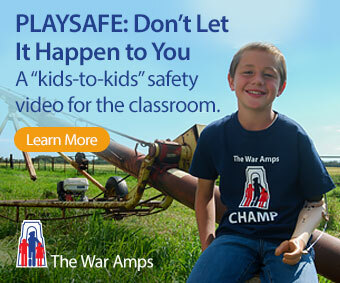 We think it is reasonable that postal authorities should consider pursuing this line of thinking with print on demand stamps, and perhaps involve schools in the design of regional issues that highlight subjects that have little or no chance to be considered for the mainstream stamp program. Irv Osterer is the department head of Fine Arts and Technology at Merivale High School in Ottawa. He is the coordinator of the Ottawa Carleton District School Board’s Communication & Design Specialist High Skills Major (SHSM) program.